Our Lower School students have been very busy this term. Learning is happening all over campus – in and out of the classroom. Mr. Hopkins’ class is studying birds, and UMaine biology student, Emily Gagne, visited his classroom with an owl presentation on Friday. Emily worked at Squam Lakes Natural Science Center and Maria Mitchell Natural Science Museum over the last two summers and is currently applying for her PhD in Biology. Mrs. Gagne (Emily’s mother!) just launched a unit on the Republic of Malawi in southeast Africa that will culminate with a service project benefitting Malawi children and their families. Grades K-4 are well into their ice skating unit at NYA’s Travis Roy Arena as part of PE. Many out-of-the-classroom activities also occur in the Middle and Upper Schools. Ms. Lauerman’s AP Environmental Science class recently made a trip to Pratt’s Brook Park in Yarmouth to study standard forestry methods. They assessed a stand of trees to determine whether they were ready for harvesting. Ten NYA students performed as part of the District II Instrumental Honors Festival this past weekend. These students were selected from a pool of over 1,000 auditions to fill slots in the District II bands and orchestras. They spent two days rehearsing with other students in the district before capping off the weekend with a performance in front of a packed gym at Oxford Hills Comprehensive High School. NYA Studio Band was out performing again in the community! After a terrific preview during Upper School lunch in Safford on Wednesday, Studio Band performed their acoustic show at One Longfellow Square on Thursday evening. I hope you were able to make it out to see this talented group of NYA musicians. Here’s a link to their show! There is one final opportunity to see them – the Last Waltz on Friday, February 15, from 6:30 to 8:30 p.m. in Safford. The sixth grade geography class is in the midst of a unit on Asia. They spent the past week learning about Mongolia, where one of our teachers, Eliot Grady, lived and worked for eight years. With the help of Jack Schaeffer ‘22, a child-sized yurt was assembled in the library for students to learn about this amazing type of structure. Students also tried on traditional Mongolian clothing and played games with sheep and goat anklebones, just as their counterparts in Mongolia do. Finally, students became amateur anthropologists and examined genuine Mongolian artifacts, such as a ladle made out of a wild sheep horn and a birch-bark container, to see what they could reveal about the way of life of Mongolians past and present. Next up in geography class – Russia and China! Members and coaches of the U-Maine Women’s Hockey Team visited NYA’s Travis Roy Arena and practiced with the NYA girls team this past week. In addition to running the practice, the players spoke with our team about their experiences and answered questions. It was a great opportunity for our girls. Our athletic teams have been busy this winter. The NYA girls hockey team was in action yesterday with a home game vs Worcester Academy (the boys game was postponed due to the weather). The track team is in competition every Friday at USM, and our basketball teams have frequent home and away games. Be sure to check the athletics calendar and come support all our teams! The NYA College Counseling Office held a College Planning Night for Juniors Tuesday with guest speaker Ms. Whitney Soule, Dean of Admission and Student Aid at Bowdoin College. Ms. Soule attempted to demystify portions of the college acceptance process and discussed the key roles of the students’ college counselors, college admissions office, and parents. It was followed by a Q & A session. Thursday was Discovery Day in the Upper School. Eighth grade students were surprised by Upper School hosts and given a glimpse into a day in the life of an Upper School student. The students visited classes, had lunch with their hosts, and it all culminated with “make your own sundaes” in Safford. We hope the eighth graders learned something new about the Upper School. If you or your student ever has questions about another grade or department at the school, I encourage you to reach out to Mrs. Markonish, Mr. Austin, or me to learn more. 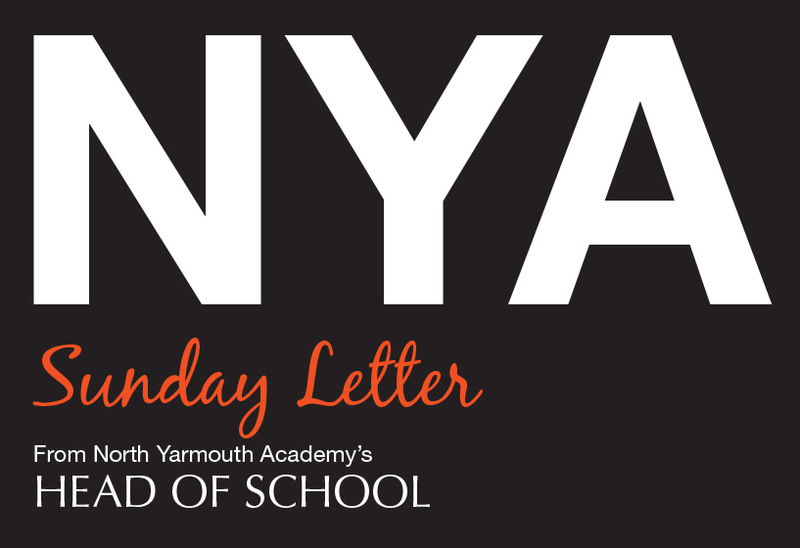 A great opportunity to get involved at NYA: Calling all NYA parents, faculty, staff, and friends! Please join us on Wednesday, February 13 from 2:00 to 2:30 pm in the Middle School Community Room to share your thoughts and ideas on the Soirée, NYA’s biggest fundraising event of the year. We would love to hear from you. The annual NYA Soirée will take place on Friday, April 26, 2019 at Thompson’s Point in Portland at their new event space, Halo at the Point. This year’s gathering will include a live auction, games, cocktail reception, dinner, entertainment, and plenty of fun. Planning for the Soirée is underway by event chairpersons Josie Griffin P’27, P’30; Jen Edwards P’30, P’32; Gretchen Lacombe P’22, P’25; and Amity Jackson P’21, P’22, P’26; in concert with the Development Office. If you have ideas for the event, please share them with this team. Also, if you are able to donate an auction or game prize, kindly be in touch with the event chairpersons or Crystal Gordon in the NYA Development Office. In the past, successful auction items have included jewelry, travel packages, concert and sporting event tickets, fine dining, artwork, and other unique experiences. Game prizes are typically smaller items such as gift cards, flower arrangements, beer and wine, and sweet treats. Please help us make this a fun, meaningful night for NYA! Project Graduation is an overnight, safe, fun filled, alcohol-free program of activities for our seniors after graduation. Project Graduation volunteers are currently selling raffle calendars for $10.00 and raffle tickets for a Celtics game. Another fundraiser for Project Graduation includes donating funds through CLYNK recycling. Visit the Project Graduation webpage for details on all these fundraisers. Wednesday, January 30 – Lower School Live from 9:00 to 10:30 a.m., designed for families interested in the Lower School. Parents of prospective students will meet with Mrs. Markonish and observe Lower School classes in action. Stay safe from the storm and have a great week!